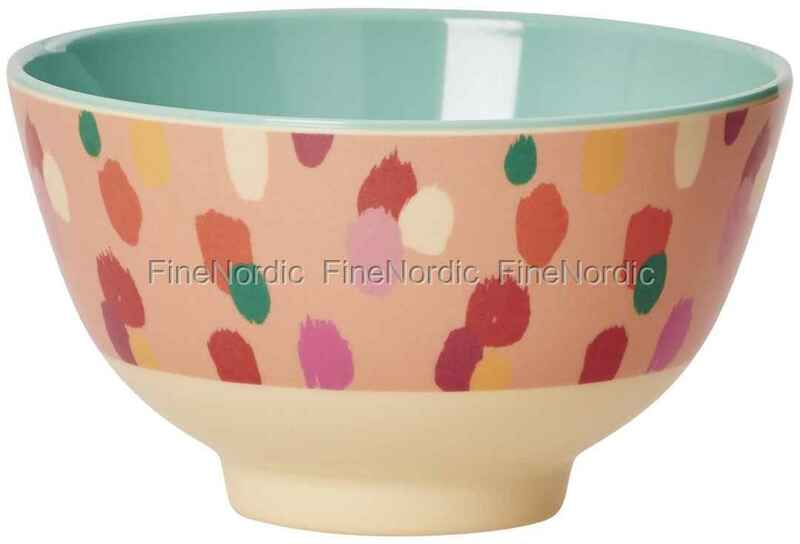 The small melamine bowl with the Two Tone Coral Dapper Dot print is made for small children's hands. There is room for the favorite snack in it and it is made of sturdy melamine and is therefore very resistant and the colorful splashes of color of the Dapper Dot Print put a smile on children's faces. The colorful outside of the bowl is an attractive contrast to the monochrome inside and the handsome pattern can also be admired on other Rice tableware. Combine the bowl with the other Coral Dapper Dot Print products or let it be a special eye-catcher when mixed with plain Rice crockery. The melamine bowl for the young and old is a useful helper at picnics, garden parties or birthday parties and also during everyday life. A multitalented bowl is the Two Tone Coral Dapper Dot bowl, which soon will turn it into the favorite bowl in the kitchen cabinet.